About eighteen months ago I fell victim to a dreadful illness which took me over for two weeks. It was called Jonathan Strange and Mr Norrell-itis and its outward manifestations were a far away look, a lack of attention to daily life and dark circles under the eyes. The cause of this was, of course, the discovery of this wonderful book by Susannah Clarke, all about magic and faerie in England. On the face of it this was not a book that appealed to me in the slightest and I ended up reading it, not for reasons of literary merit, but because Amazon was selling it half price (come on we have all done this, let's be honest...). So it arrived, I struggled through the first 50 or so pages thinking this is not for me, and then I arrived in York Minster and Jonathan Strange brought the statues to life and that was it. I was hooked. This book is of doorstep size and cannot be carted onto the commute so it was evenings and weekends until I had finished it, hence the black circles concomitant with nightly reading in bed till 2 am in the morning despite the fact I had to get up in 4 hours to get on the train and go to work.I know this is one of those books that you either love or loathe and while loving it, I can understand why others could not get on with it, but I think they are missing a treat. No matter. Susannah Clarke apparently spent over ten years writing this book so Jonathan Strange and Mr Norrell, the Sequel, is not likely to hove over the horizon any day now. So I was delighted to see The Ladies of Grace Adieu appear. First thing to say about it, is that it is beautifully produced. I have a pale pink and grey version in a wonderful slip cover gives the book a wonderfully magic, historical, old fashioned feel about it. Beautifully illustrated by Charles Vess in black and white, almost Beardsley-ish in some cases, it is a joy to have. Now we come to the content. Well, of course Susannah Clarke has not produced a new work. If the reader checks the inside ISBN page he or she will see that this is a collection of short stories previously published in a New York Magazine, Starlight or the New York Times. 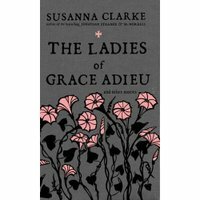 The title story The Ladies of Grace Adieu rather cunningly features Jonathan Strange so that those of us who have read her earlier work are immediately hooked should we pick this up in a book shop and read the first story. It would appear that this was published in 1996 when one assumes Susannah Clarke was writing her Magnus Opus, so did she do this as light relief and featured one of her main protagonists in her work in progress, or did she re-write it to fit into this collection and act as a selling point? Just a thought. So, whether they are new or old doesn't really matter to me. I love this collection and it will keep me going until Susannah Clarke gives us another tome to keep us up at nights. You can't blame Bloomsbury for plugging into the JS&MN selling point. Let's face it, with the last Harry Potter coming out this year and no more uber-profits coming in, they have to do something.